You wouldn’t know these were gluten-free. They’re yummy! •	Prepare the brownies: Preheat your oven to 350°F. Grease and line an 8-inch square pan with two sheets of unbleached parchment paper, crisscrossed in the pan with enough paper to overhang all the edges, and set it aside. •	In a large bowl, place the flour, xanthan gum, cocoa powder, salt, and granulated sugar, and whisk to combine well. Add the brown sugar and whisk again, working out any lumps. Create a well in the center of the dry ingredients and add the butter, oil, vanilla, corn syrup and eggs, mixing to combine after each addition. The batter should be thick and smooth. Scrape it into the prepared baking pan and spread into an even layer with a moist spatula. Place in the center of the preheated oven and bake until just firm to the touch and a toothpick inserted into the center comes out mostly clean, 25 to 28 minutes. Allow to cool completely in the pan. •	When the brownies are nearly cool, prepare the topping: Place the chocolate in a medium-sized, heatproof bowl, and set it aside. Place the cream in a small, heavy-bottomed saucepan and bring to a simmer over medium-low heat. Add the salt to the cream and stir to combine. Pour the warm cream over the chopped chocolate and allow to sit until the chocolate begins to melt. Stir until the chocolate is melted and smooth. Allow the mixture to cool for about 2 minutes before pouring over the cooled brownies, still in the pan, in an even layer. Scatter the miniature M&Ms (Ms side down, if you’re being fastidious) over the chocolate layer, and allow to set at room temperature for about 30 minutes before transferring to the refrigerator. Allow to chill in the refrigerator until firm, about another 30 minutes. Remove from the refrigerator and lift the brownies out of the pan, using the overhanging edges of the sheets of parchment paper in the pan. 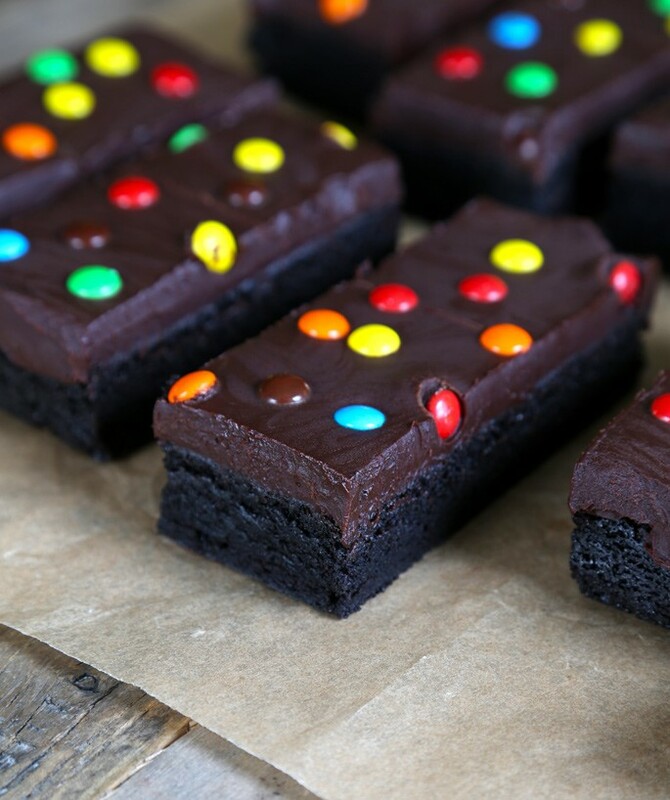 Place on a cutting board and slice the brownies into twelve equal rectangles. With a butter knife, create a seam widthwise down the center of each brownie. •	Storing instructions: These can be covered and stored at room temperature for up to 3 days. For longer storage, seal tightly in a freezer-safe wrap or bag, and freeze for up to 2 months. Defrost at room temperature. Whoo Hoo! This one needs to be made today! Well, I may have to curb my enthusiasm I’m still trying to catch up on work. But then…I get to have a treat. Thank you for the recipe. Yes. One does have to have a treat after all that hard work! Happy working!